BSN’s mission is to encourage savings, investments and smart financial management among Malaysians to increase their quality of life. BSN has more than 5,100 employees, 382 branches and 621 automatic teller machine (ATM) nationwide. BSN has more than 7 million customers spread throughout the length and breadth of the country and with savings of more than RM 8 billion. BSN is continuously enhancing its services as well as expanding its range of products for the benefit of its customers. 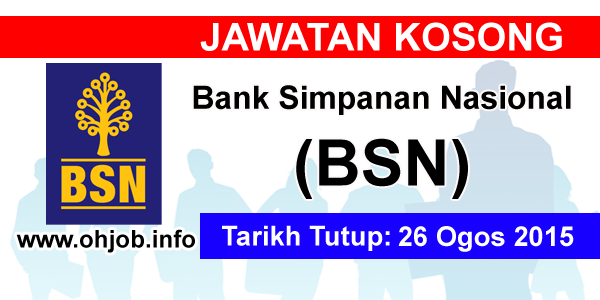 BSN’s main products include Personal Financing, mortgage loans, Premium Saving Certificate (SSP), Islamic Banking Scheme, Giro Savings Account, BSN Matrix and Matrix-i Debit Card as well as VISA and Mastercard credit card. Terima Kasih Kerana Membaca Dan Menyemak Jawatan Kosong Bank Simpanan Nasional (BSN) (26 Ogos 2015) Selamat Memohon Dan Semoga Berjaya Kami Ucapkan, Sila LIKE Facebook Page Kami Dan Kongsikan Kepada Semua.